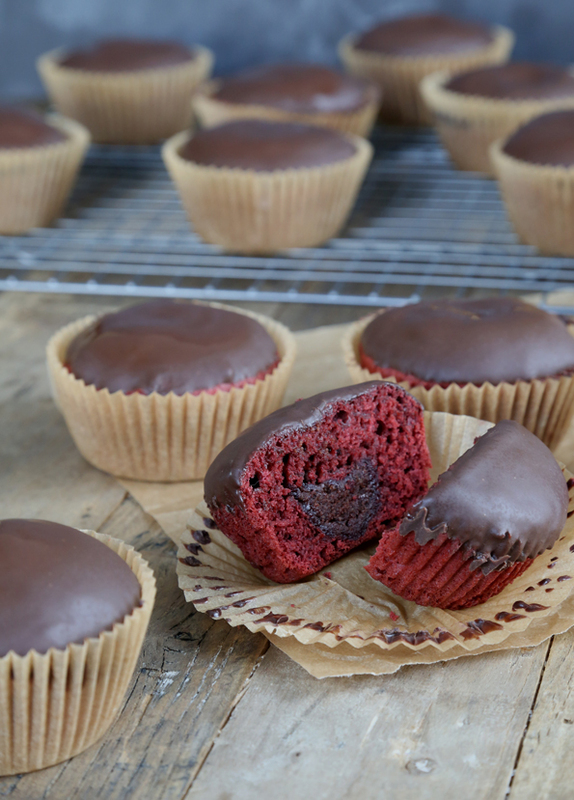 Stuffed Gluten Free Red Velvet Cupcakes | Great gluten free recipes for every occasion. My son turned 10 yesterday. He already has a whole birthday dinner (and cake) picked out for our actual celebration this weekend (bacon cheeseburgers on gluten free Hawaiian Buns with a “side salad” with avocado, and a chocolate zucchini layer cake (specifically), plus homemade ice cream (mint chocolate chip, please) with homemade chocolate sauce for dessert—not that he’s given it much thought). You know, when we’re not rushing to get homework done, racing against the crazy winter weather we’ve been having and rushing to the batting cage to get in a lesson? I’m so grateful that I work from home so that I can do all of the running back and forth and my kids can have me there for homework, but it’s still just not possible to celebrate a birthday on a Tuesday anyway. That doesn’t mean that we can’t have cupcakes, though. 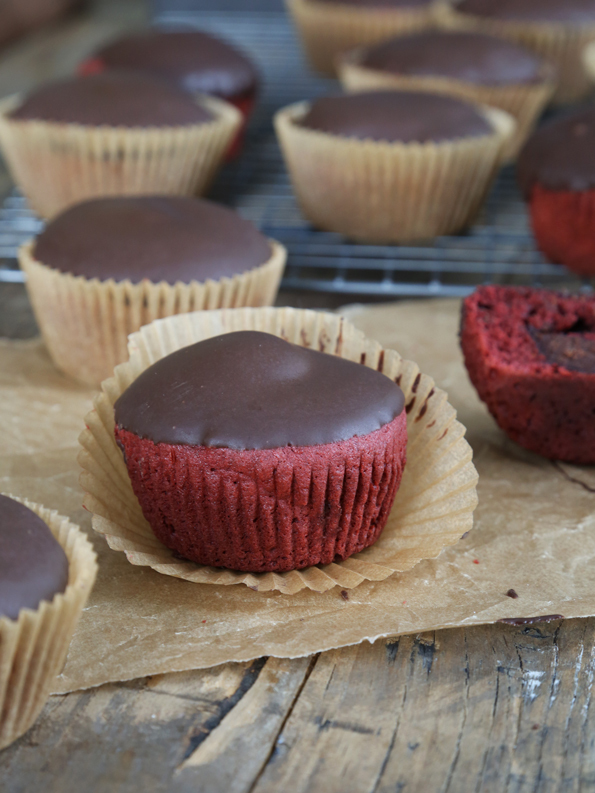 And since Valentine’s Day is coming up in 9 days (which to me really means the day that I can binge-watch House of Cards on Netflix), stuffed gluten free red velvet cupcakes with a simple chocolate glaze are just the thing. Now before we go any further, I know that there are some of you who think that red food coloring is the devil’s plaything. Clearly, I’m fine with food coloring in moderation. I know that there are others who have made red velvet cake with beet powder, but that’s not my angle here. If you don’t like red food coloring? Leave it out! Problem solved. Red velvet cake didn’t used to be as electric red as we seem to expect it to be these days. It used to be mildly red-tinged because of the cocoa powder. 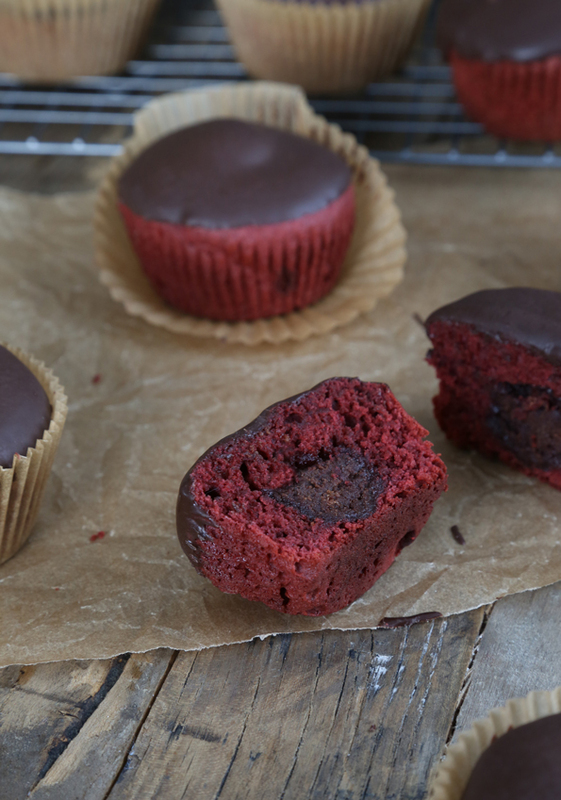 The truth is, all chocolate has a lot more red in it than you think. Try taking a picture of some chocolate, and then really looking closely at it. It has a lot of red in it. These aren’t just any gluten free red velvet cupcakes, in case you were wondering (especially since we made those here on the blog, like, 100 years ago). These are a bit richer, and, in case you hadn’t noticed, they’re stuffed with chocolate truffles. Truffle-stuffed! Clearly, I did not make a 1/4 recipe of Easy Fudge Truffles. I made a whoooooole recipe, and then stashed the rest for emergencies. They happen. They just … do. Stuffing the cupcakes with truffles allows us to bake the cupcakes with the filling, rather than cutting out a section of each cupcake after baking, filling it with something delicious (like frosting or a truffle, say) and then covering it back up. That method works indeed, and I use it on occasion. But I just really liked the idea of having a truffle born right in the center. The chocolate glaze on top is (of course) totally optional. You could also frost these with, say, white chocolate frosting, or with cream cheese frosting, which is kind of traditional (and super easy, too). It’s up to you. Like the food coloring. That’s the beauty of baking at home. You can customize! Preheat your oven to 350°F. Grease or line a standard 12-cup muffin tin and set it aside. In a medium-size bowl, place the flour, xanthan gum, cornstarch, salt, baking powder, baking soda and cocoa powder, and whisk to combine well. Set the bowl aside. 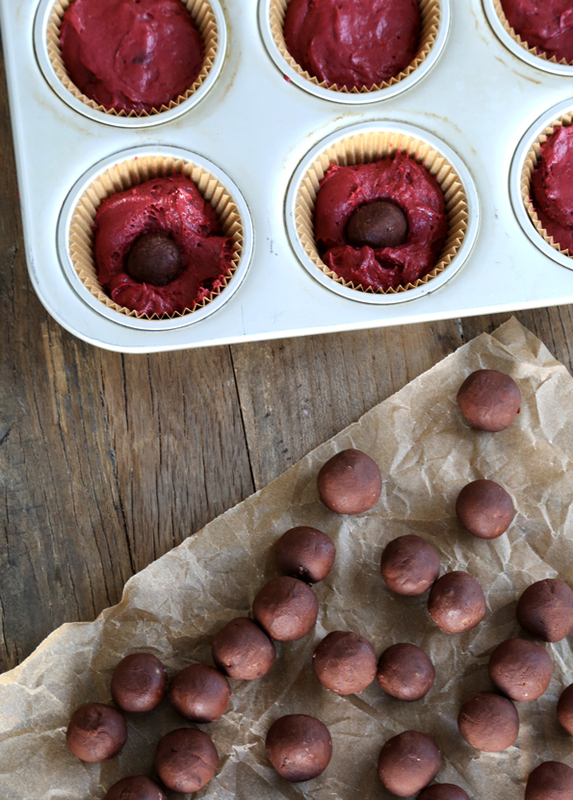 Divide the Easy Fudge Truffles (if using) into 15 pieces, rolled tightly into balls about 1/4-inch in diameter. They don’t need to be pretty! They’ll be baked inside the cupcakes. If it makes them easier to handle, chill the truffle mixture before shaping. Set the truffles aside. In the bowl of a stand mixer fitted with the paddle attachment (or a large bowl with a handheld mixer), beat the butter on medium-high speed until light and fluffy. Add the granulated sugar, followed by the eggs and vanilla, beating to combine well on medium-high speed after each addition. Add the vinegar and then about a scant 1/8 teaspoon of the food coloring, if using, and beat to combine very well. The mixture may look a bit curdled, and that’s fine. Add the dry ingredients, alternating with the milk, and beginning and ending with the dry ingredients, mixing to combine after each addition. The batter should be smooth and relatively thick. Place enough batter in each of the prepared muffin cups until they are about half full, nestle an (optional) truffle in the center of the batter in each cup, pressing it in about half-way down into the batter, and then cover with enough batter until the cup is about 3/4 of the way full. If not using the truffles, fill the wells a full 2/3 to 3/4 of the way full with batter. With wet hands, smooth the tops of the batter in each cup. Place in the center of the preheated oven and bake for 19 minutes, or until a toothpick inserted to the left or right of the center (the center will have the truffle!) of the cupcakes comes out mostly clean, or with a few moist crumbs attached. Remove from the oven and allow to cool in the muffin tin for 10 minutes before transferring to a wire rack to cool completely. 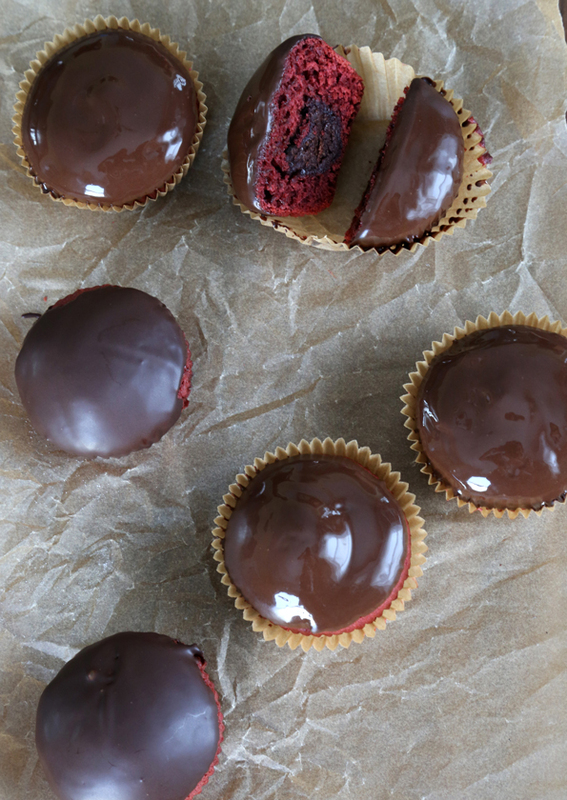 Once the cupcakes are completely cool, place the chopped chocolate in a small heat-safe bowl with the shortening, and melt both either over a double boiler or in the microwave in 30-second bursts until the mixture is melted and smooth. Dip the top of each cooled cupcake in the chocolate mixture, bob it up and down 3 times before carefully lifting it out of the chocolate and twisting it slightly as you turn it right side up to avoid dripping chocolate. Allow the glaze to set at room temperature before serving. P.S. Remember your copy of Gluten Free on a Shoestring Bakes Bread! It means more to me than you know. Well, I did it! I made these with cream cheese in the center instead of chocolate. Just mixed sugar, cream cheese and vanilla and added a teaspoon blob just the way Nicole adds the truffle. Once it cooks it’s a thin layer of cheese cake in the cupcakes. Thanks nicole, my daughter’s first red velvet cake experience! Mint chocolate chip was one of my husband’s favorite pre-GF! Any chance you’ll be posting a recipe? You have bowled me over with happiness with this post. Just last night I thought to look up a recipe for gf red velvet cupcakes. These look delicious! This is just….there are no words to describe my feelings right now! This look sooo awesome! I’m having a get together later this month that the “ladies” will love!! The ladies, Jennifer! I think they’ll love them. These cupcakes are quite lady-like. A psychologist friend of mine has told me that her kids are just as likely to end up in therapy as adults, despite her profession! And it’s likely the things that we’re NOT thinking about that will send them there!! So don’t worry about the breadsticks, but do worry about??? If I make a whole batch of truffles, I will be truffle stuffed. Ahem, some of us don’t have as favorable of a metabolism… And hey, I was just using your term. Truffle-stuffed! They might not make it into cupcakes, just into me.